Osen’s RV Park, located in Livingston, Montana, is a full service RV Park offering you a picturesque, quiet and convenient location while you are enjoying Montana’s many attractions. Livingston, Montana is valued for its blue ribbon fly-fishing, hiking, biking, canoeing, floating and rafting, horseback riding and access to magnificent wilderness areas. Yellowstone National Park is located a short 50 mile drive south through stunning Paradise Valley following the Yellowstone River, the longest free-flowing undammed river in the lower 48 states. See area attractions for great day trips from Osen’s RV Park. Osen’s features pull-thrus and back-in sites with full hook-ups with 50/30/20 amp service, cable TV, and Wi-Fi as well as a private bath house and laundry facilities. Our RV Park can accommodate Big Rigs and we welcome your pets, too! 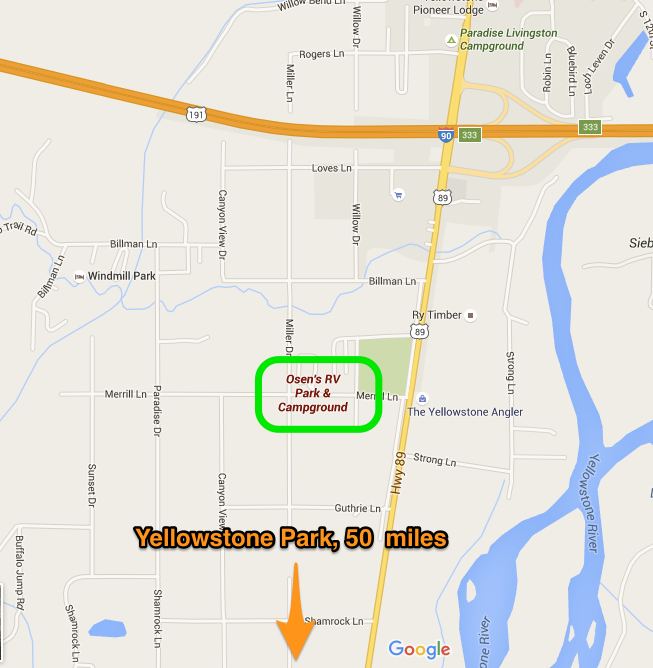 We are conveniently located from Exit 333 of US Interstate I-90 (See Map). Our park provides you with a quiet location surrounded by mature trees with a mountain view. We are at an altitude of 4500 ft. See our facilities and rates for more information.